Our kids had a chance to visit a local Farmer’s Market this past weekend. One of the special treats we found…HOMEGROWN POPCORN! Our kids thought it was DELICIOUS! We ate it, played games with it, and made a special word wall to use. 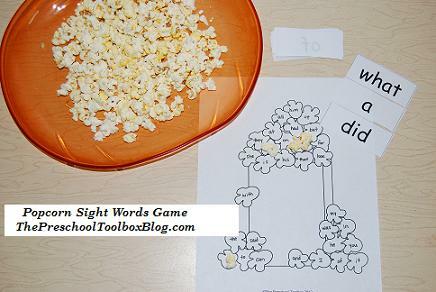 Materials needed: Popcorn Sight Words pdf file/one per child (linked above) and Popcorn Sight Words Cards/one per child or small group (linked above), scissors, and popcorn or other small counters (beads, shells, unifix cubes, etc.) *NOTE: Popcorn with small children can be a choking hazard. Make sure to supervise children closely if using real popcorn. Have the children put the word cards face down in one pile on the table or the floor. The children take turns drawing the word cards and placing a counter or popcorn piece on the matching word on the game mats. For older children: Have the children take turns reading the word cards. If the child reads the word card correctly, he can then cover the matching word on his work mat. Play until one child has all the words on the popcorn mat covered (or for a predetermined amount of time). For younger children: LIMIT the number of cards played with. Have the children match only those word cards to the words on the work mats. There are extra word boxes at the end of the file to add any additional sight words desired. 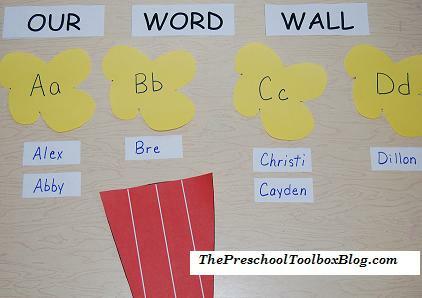 There are MANY different ways to make and use word walls for kids! At the beginning of the year, using names will help your children identify their own name and the names of classmates. THEMATIC – make a word wall and post words about topics covered in the classroom. SIGHT WORDS – add sight words as they are introduced to the children. PEOPLE, PLACES, and THINGS – Make a word wall of the people, places, or things the children meet/visit/see in the first month of school. This is helpful for young children as they meet school administrators, librarians, other teachers, aides, etc. Place a picture of the person by the word card and review frequently with the children. EMOTIONS – Make a word wall of emotions. Many children feel a variety of emotions at the beginning of the school year. Play games with the children as they add new words for emotions they might have. Discuss with your children how to best deal with each emotion in the classroom. If they are scared, is it ok to tell you? Many children need to know that school is a safe place to express emotion and ask for assistance. Files to Print for a Popcorn Word Wall: Use the files below to make a popcorn-themed word wall. For a sight word wall, print the sight word cards (linked in the activity above) and add to your wall as they are introduced to the children. The blank cards in the file can be used for additional words or names of the children, if desired. OUR WORD WALL CARDS – this file also contains blank cards to use as desired. 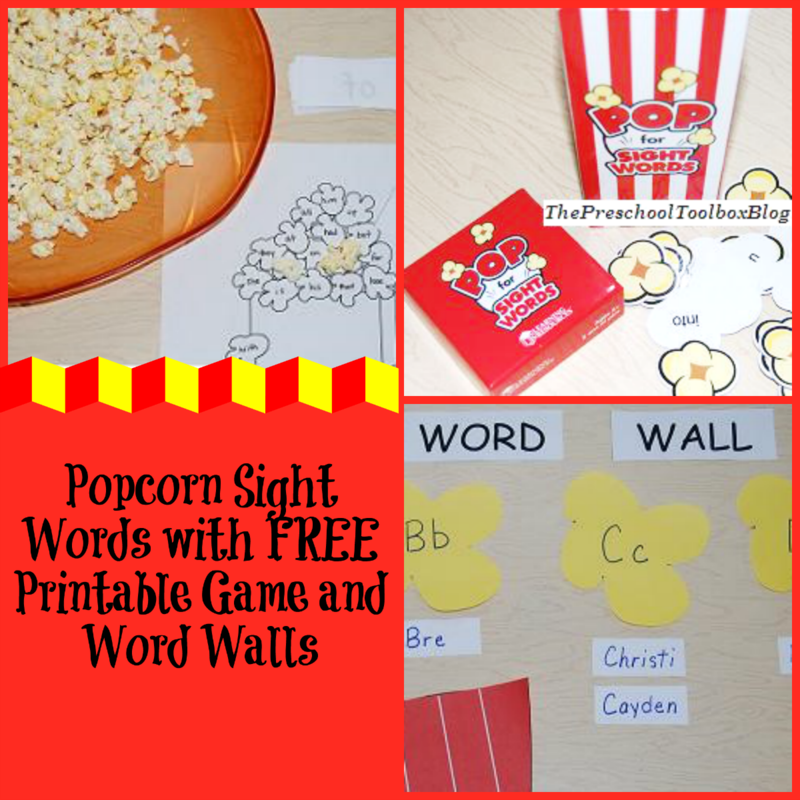 The Pop for Sight Words Game by Learning Resources contains many popcorn-themed sight words to introduce to your children. Our kids use the popcorn game and word cards throughout the year. 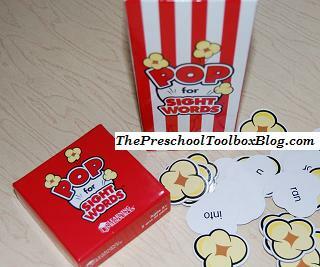 The cards are durable enough to be used on a popcorn word wall too! For more awesome activities, see the Preschool and Kindergarten Themes for Active Learning and Play! So excited to use these games!